We’re sorry! This Owner Adventure is sold out. Please call Bluegreen Travel Services at 800.459.1597 to learn about similar cruise tours. From $6,400(1)(2) per person, based on double occupancy, Cat. E: Oceanview stateroom SOLD OUT! From $7,345(1)(2) per person, based on double occupancy, Cat. D: Balcony stateroom SOLD OUT! From $7,750(1)(2) per person, based on double occupancy, Cat. C: Balcony stateroom SOLD OUT! From $8,695(1)(2) per person, based on double occupancy, Cat. B: Veranda stateroom with butler service SOLD OUT! Yet-to-be published flight schedules may require an early evening departure from Los Angeles on December 5; if this occurs, an additional room night will be provided at the hotel in Papeete, Tahiti. Single accommodations may be available; call for rates. Booking deadline is July 31, 2019, or until sold out. Learn More by Watching Our Recorded Webinar! Get the details about Bluegreen’s Exotic South Pacific Discovery by watching our recorded webinar. In just about an hour you’ll discover why you should join us on this 2019 Owner Adventures vacation. Discover your own island inspiration in the destination that enchanted French artist Paul Gauguin and American author James A. Michener. On this land-and-sea vacation you’ll explore the best of the South Pacific islands, starting with a stay in Tahiti, the “Queen of the Pacific,” followed by a cruise of the Society Islands, with stops in lush Huahine, beautiful Bora Bora and postcard-perfect Moorea. Located in the heart of the South Pacific, Tahiti’s capital city of Papeete is just eight hours by air from Los Angeles and on the same side of the International Dateline as North America. Best of all, your round-trip international flight from Los Angeles is included! (1)(2) Upon your arrival in the morning, you’ll have early check-in for your stay at the Intercontinental® Tahiti Resort & Spa. Explore Papeete on your own and meet your Bluegreen host and fellow Bluegreen owners in the evening at a Soiree Merveillueuse Welcome Dinner & Polynesian Show at the hotel. Then board the m/s Paul Gauguin, the longest continually sailing luxury ship in the South Pacific. Designed specifically for gliding through the shallow seas of French Polynesia, this boutique ship accommodates just 332 guests and offers spacious suites and staterooms, an onboard watersports marina, three dining venues, a lounge and disco, casino, fitness center and spa. A beloved troupe of Gauguines and Gauguins—locals who serve as cruise staff, entertainers and storytellers—are aboard to help you learn about the rich heritage of the islands you will be visiting. Your sailing features overnight stays at Bora Bora and Moorea and time at the relaxing private island paradise of Motu Mahana. You’ll have two included group excursions that highlight the culture of Taha’a and the sacred sites of Huahine before you return to Papeete for one last night aboard ship. We must warn you, once you’ve made these islands your home—even if just for a short time—they’ll always be calling for you to return! For U.S. residents only, Travel Protection will be purchased on your behalf by Bluegreen Vacations when you book this Owner Adventures vacation package. Your adventure starts with your arrival in Los Angeles for your overnight flight to Papeete, Tahiti. Welcome to the South Pacific paradise of Tahiti! The islands of Polynesia are a gorgeous collection of 118 volcanic atolls strewn across the grand Pacific Ocean, and the island of Tahiti is the largest of them all. You will arrive in the morning and be transferred to the Intercontinental Tahiti Resort & Spa. Early check-in is guaranteed for your Panoramic Lagoon View room. Enjoy the hotel’s lavish garden setting surrounded by clear, turquoise seas. The hotel boasts two infinity pools and a luxury spa where you might choose a pampering massage. Or relax with your favorite adult beverage in the Lobby Bar. Spend the day your way, and then join your Bluegreen host and fellow adventurers for a Soiree Merveilleuse Welcome Dinner & Polynesian Show this evening. Dinner is included today; overnight in Papeete. Enjoy a morning at leisure at your hotel, including breakfast and a light buffet lunch, before you’ll be transferred to the pier and board the m/s Paul Gauguin to begin your sailing through French Polynesia. Designed specifically to glide through the shallow seas of the South Pacific, the flagship of Paul Gauguin Cruises® is a small-ship cruiser’s dream. She delivers travelers to intimate ports inaccessible to larger cruise ships, all the while providing an onboard experience that is nothing short of luxurious. Guests enjoy spacious suites and staterooms—more than 70% with private balconies—an onboard watersports marina, three dining venues, an extensive spa and top quality service. Life onboard also reflects the beauty and rich cultural heritage of the islands she calls upon, with a warm, friendly feel, an informal setting and even a beloved troupe of Gauguines and Gauguins—local Tahitians who serve as cruise staff, entertainers and storytellers. Breakfast and light lunch at hotel; dinner aboard ship; overnight aboard ship. Huahine is known as “The Garden Island” for its beautiful rainforests, dramatic terrain and enchanting lagoon. The area’s sacred sites and archaeological landmarks that are among the best preserved in French Polynesia. Explore this picturesque and diverse island during an included Sacred Sites & Legendary Places excursion. Receive a friendly introduction from your expert anthropologist/archaeologist guide, who has firsthand experience working on the sites you will visit. Board “Le Truck,” French Polynesia’s local-style bus, and depart from Maroe Village on the small island of Huahine Iti, crossing the bridge to Huahine Nui, or “big island.” Here you will drive past lush green valleys and turquoise lagoons through the capital town of Fare, where Captain James Cook sojourned on his visits to the island. Your first stop is Maeva village, considered one of French Polynesia’s most important archaeological areas and home to the largest prehistoric habitation site in Polynesia. During your walk through the village, you will explore the archaeological sites along the lake shore and the Fare Pote’e Museum. You will learn about Polynesian origins and migrations, traditional society, religion, botany and European explorers, and get a firsthand look at various traditional tools, handicrafts and artifacts. Continue on to Mata’ire’a hill, just above the Village of Maeva and home to more than 200 stone structures, including marae, communal or sacred places, plus agricultural terraces, house foundations, fortification walls and burial platforms. Your next stop is a family-run vanilla plantation, where you can purchase various vanilla products. Then learn about 500-year-old fish traps that are being used today by the people of Maeva Village. Your return drive to port will take you through the village of Faie, where your guide will feed the island’s giant blue-eyed eels that swim in the stream. You’ll also have a photo stop at Belvedere Lookout with its stunning views of Huahine Iti and beautiful Maroe Bay. You’ll still have time to see more of the island on your own before reboarding the ship. All meals aboard ship; overnight aboard ship. Enclosed in a common lagoon with Raiatea and accessible only by boat, Taha’a is an ideal island for a relaxing getaway. A sleepy island that boasts only a handful of guesthouses and small hotels, Taha’a maintains an authentic Polynesian flavor. Speaking of flavors, it produces about 80% of French Polynesia’s world-renowned vanilla, a must-buy during a visit to the island. Taha’a is also home to Motu Mahana, Paul Gauguin Cruises’ private island. Enjoy a Taha’a Cultural Tour here. After a brief tender boat ride to the pier, you will be met by your local guide and “Le Truck.” Visit a vanilla plantation, where you will have a brief tour of the grounds and a presentation about the farming and cultivation of this precious spice. Next learn about the history, the legends and present-day life of Taha’a. There will be a number of photo stops along the route. Your final stop will be at the Motu Pearl Village, where you will learn about the creation of the Tahitian Black Pearl and enjoy refreshments and local fruits in season. You will be transferred by boat directly to Motu Mahana, where you can enjoy swimming, snorkeling and kayaking, or simply lounge on the beach with a chilled beverage from a floating bar. Les Gauguines will also be on hand to provide musical entertainment and demonstrate traditional Polynesian crafts, and a delicious barbecue lunch will be served. 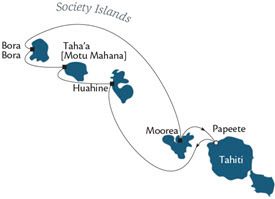 Breakfast and dinner aboard ship; lunch on Motu Mahana; overnight aboard ship. With lush peaks, white sand beaches and romantic lagoons, Bora Bora just begs to have its picture taken. Its most iconic image is Mount Otemanu with its jagged, emerald-hued peaks rising high above the shoreline. With only 4,225 inhabitants and a laidback, island vibe, visitors to this beautiful corner of the world can’t help but just relax and take it all in. Your ship remains in port overnight, providing you with two full days to discover the island’s delights on your own, or perhaps book an optional excursion, such as an ATV adventure, Aquasafari, sunset catamaran sail, glass-bottom boat tour or SCUBA dive. All meals aboard ship; overnight aboard ship. Your ship remains in port until early evening, so you’ll have more time for on-your-own exploring or book an excursion. Kayaks and paddleboards from the ship’s marina will be available on a first-come, first-served basis on the beach in the afternoon. All meals aboard ship; overnight aboard ship. Often likened to James Michener’s mythical island of Bali Hai, Moorea is worth a visit just to experience its spectacular vistas. Volcanic peaks, reflected in the waters of Cook’s Bay and Opunohu Bay, rise like a shark’s jaw above palm tree-lined beaches. The underwater world is just as enchanting, with sharks, tuna, dolphins and tropical fish—no wonder it’s a popular destination for divers. Your ship stays in port overnight. Relax on one of Moorea’s beautiful beaches or book an optional excursion, such as a photo adventure, island drive, snorkeling, waverunner ride or dolphin experience. Kayaks, stand-up paddleboards and a wind-surfer will be available from the ship’s marina on a first-come, first-served basis in the afternoon. All meals aboard ship; overnight aboard ship. Your ship remains in port until early evening, so you’ll have more time for on-your-own exploring or book an excursion. Kayaks, stand-up paddleboards and a wind-surfer will be available from the ship’s marina on a first-come, first-served basis in the afternoon. Your ship returns to Papeete this evening and remains in port. All meals aboard ship; overnight aboard ship. Your Exotic South Pacific Discovery adventure ends this morning with disembarkation and a short tour of Papeete. Day rooms will be provided for your comfort while you wait for transfers to the airport for your flight to Los Angeles. Breakfast is included today. Call 800.459.1597 to Book Your Exotic South Pacific Adventure Today! *TRAVELER PLUS POINTS-FOR-TRAVEL BENEFIT TERMS & CONDITIONS: In order to apply any combination of annual, biennial, borrowed or rented Bluegreen Vacations Points for payment, Owner Adventures vacation price, including base fare and taxes, must be a minimum of $500 per person for the first and second travelers in a room or cruise cabin, for a total minimum fare of $1,000. Benefit applies only to active Traveler Plus members. **BLUEGREEN TRAVEL SERVICES ONBOARD CREDIT OFFER TERMS & CONDITIONS: $100 onboard credit per stateroom available when booked through Bluegreen Travel Services by July 31, 2019. Onboard credit may be used for select purchases aboard the cruise ship and has no cash value. New bookings only. Subject to availability. Terms and conditions apply. The cruise fares shown are in U.S. dollars and are per person, double occupancy, are for new bookings only, are subject to availability, may not be combinable with other offers, are capacity controlled and may be withdrawn at any time without prior notice. International airfare from Los Angeles is included in the cruise fare; terms and conditions apply. See complete Terms & Conditions. Price is per person based on double occupancy and includes round-trip, economy-class flight from Los Angeles; accommodations in Papeete, Tahiti; Soiree Merveilleuse Welcome Dinner & Polynesian Show in Papeete; 7-night cruise aboard the m/s Paul Gauguin; all meals aboard ship; $100 onboard credit per stateroom; Cocktail Reception aboard ship; shore excursions as noted in itinerary; short tour of Papeete and use of day rooms on day of departure, December 14; airport transfers in Papeete on December 6 and 14; gratuities for tour guides, drivers and cruise staff; and port and security fees and taxes. For U.S. residents only, Travel Protection will be purchased on your behalf by Bluegreen Vacations when you book this Owner Adventures vacation package. Limit one ticket per paying passenger for included shore excursions. Onboard credit may be used for select purchases aboard the cruise ship and has no cash value. Reservations must be booked by July 31, 2019. Nonrefundable, non-transferrable deposit of $2,500 per person is due at time of booking. Final payment due by July 31, 2019. Prices, additional fees, itineraries and availability are subject to change without notice. Certain terms, conditions, and restrictions may apply. Please call us at 800.459.1597 for additional information. Fares shown are in U.S. dollars for new reservations only and are subject to availability. Not included: airfare from home airport to Los Angeles, airline baggage fees for included and non-included flights; gratuities for hotel housekeepers, alcohol, beverages, food outside of meals provided aboard ship, optional excursions, baggage fees and all other items of a personal nature. Great Vacation Destinations, doing business as Bluegreen Travel Services, is located at 12400 S. International Drive, Orlando, FL 32821. Great Vacation Destinations is registered with the State of California as a Seller of travel Reg. No. 2068362-50 (registration as a seller of travel does not constitute approval by the State of California); Washington Seller of travel Reg. No. 602-283-711; and registered with the Airlines Reporting Corporation (“ARC”) number 15-72225-4. In the event of a conflict between Paul Gauguin Cruises’ Details of Participation and Great Vacation Destinations’ Details of Participation, Great Vacation Destinations’ Details of Participation shall govern.